Photo by Tommi Trujillo Colin Trujillo on the river. It's a gray morning but the sun is already starting to burn through the fog. It's going to be a warm day. A river otter splashes around in the clear green water as we launch our boats from the rocky shore. I'm in a canoe with my wife while our friends are spread in canoes and kayaks around us (one is even on a paddle board). The river snakes through the forests of Humboldt Redwoods State Park and each curve reveals another striking vista. Giant redwoods, Douglas fir and Sitka spruce tower from both shores, their canopies reflected on the glassy surface of the river. Osprey circle high overhead and we pass a turtle sunning itself on a rock in the middle of the water. After a few miles we stop at a secluded beach to swim and eat lunch. The noon sun is bright and clear now and the temperature is around 80 degrees. 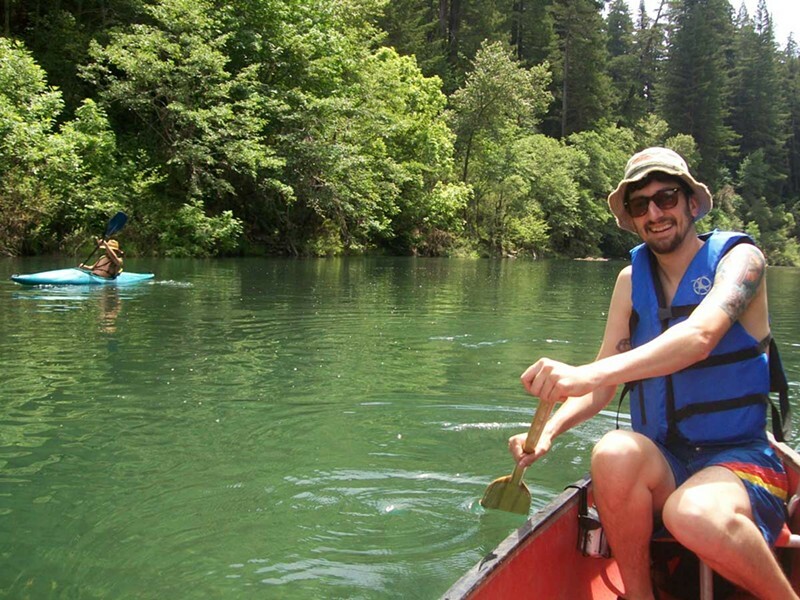 This is one of my favorite days of the year, the day we paddle the south fork of the Eel River. I first took this trip eight years ago and was so taken with the experience that I have done it every year since, turning it into a favorite tradition for my family and friends. There is nothing quite like seeing the park from the water. The near silence of a non-motorized boat is the perfect way to observe the abundant wildlife. In addition to the aforementioned otters, turtles and osprey, the park is also home to black bears, Roosevelt elk, bobcats, porcupines, weasels, deer, ringtail cats, red-tailed hawks and golden eagles. It is also worth mentioning that the Eel River doesn't contain any actual eels, although the Pacific lamprey, a jawless fish that resembles an eel, spawns in it each spring. I like to go when the weather is warm enough to swim but the flow is still high enough that you can paddle the whole way. Usually, this is sometime around the end of May or the beginning of June. I recommended starting early in the morning as the wind tends to pick up by the late afternoon. Earlier in the year the water will be high, the flow faster and the temperatures cooler — conditions that may only be suitable for experienced paddlers. Later in the year, you might have to portage a lot. Blue-green algae blooms become a problem in late summer. You can begin and end the trip at a combination of spots, depending on your timeframe and ability. A great route to start with, and the one we are doing, is from Williams Grove to Leatherwood Bar. It's about an 8-mile run and takes three to five hours, depending on the conditions, your skill level and if you stop along the way. If you want to make a full day out of it, put in at Lansdale Bar instead. This will extend the trip to around 13.5 miles and take anywhere from four to seven hours. Williams Grove has a small day-use fee, so bring cash if you plan to put in there. Don't forget to leave a car at Leatherwood Bar, as there is no shuttle service in the park. It's never a good idea to leave valuables in your car although a change of dry clothes might be appreciated later. The south fork is mostly pretty mellow in the late spring and the 8-mile run is a great trip for novice paddlers. There are a few swift turns but no significant rapids this time of year. Still, the river is unpredictable and you should always wear your life vest and go out with someone more experienced. It is also a good idea to call the ranger station the day before to see if anyone has reported any obstacles in the water. Bring lunch, sunscreen, a good hat and plenty of drinking water. I also recommend a dry bag for your phone; a Ziploc might do in a pinch. If you don't have a boat, ask your friends, someone probably has one sitting unused in their backyard. 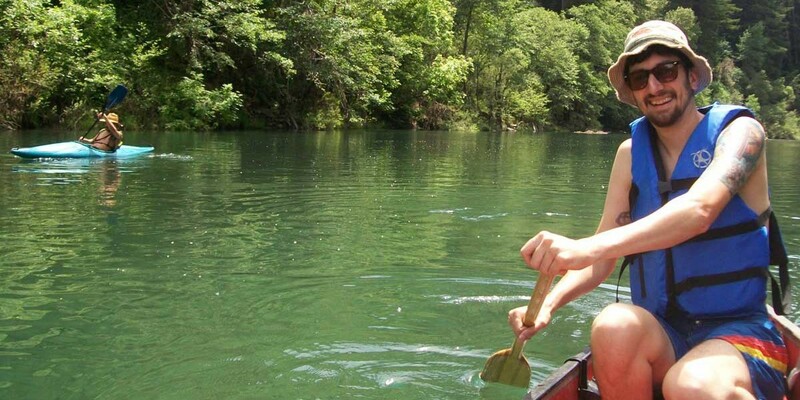 There are also several places locally that rent canoes and kayaks for reasonable day prices. As always help keep wildlife wild and, if you pack it in, pack it out. Three hours after stopping for lunch we spot our cars on Leatherwood Bar. Families are swimming and picnicking along the shore. The day is gorgeous and everyone has come out to enjoy it. It's afternoon now and the sun is still warming the rocks, but you can see the shadows of the giant trees beginning to shade parts of the water. We pull the boats onto a sandy bank and start unloading our gear. A couple people hop in a truck and head back to Williams Grove to retrieve the other cars. I take a last dip in the water and then lay out to dry off, waiting for the other vehicles to return so we can load the boats back up. Already, I can't wait to do it again. Colin Trujillo is a musician, writer, educator, and wannabe adventurer.